Biography: Selma Day has been a journalist in central London for many years. She now, along with her husband Adrian, runs Publishing Business, a prestigious publishing company that produces several magazines for areas in central London that aim to meet the interests and needs of the residential, business and international communities that make up those areas. They include Mayfair Times, Sloane Square and Belgravia magazines. Her company also founded the annual Belgravia Awards and The Community Awards of Mayfair and St James’s. As the glue that binds the community together, the awards celebrate the contribution that residents and businesses make to life in these areas. 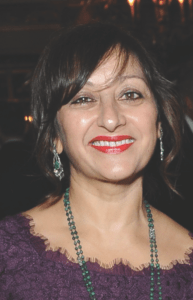 Selma, who hails from an Indian background but was born and grew up the UK, has managed to juggle a successful and rewarding career with family life – she has two grown-up children and also finds time to care for her elderly mother.